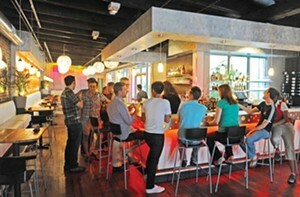 A former jail cafeteria on East Main Street became the mod, light-filled club called 2113, shown above. The bright oranges and dark walls of Que Pasa morphed into the pale, elegant dining room of the Roosevelt. And the dated Sue’s Country Kitchen cleaned up nicely to become the bright and charming Lunch in Scott’s Addition. Don’t Look Back and Ellwood Thompson’s both have new looks in Carytown that are better than the old grunge bar and Blockbuster.